Graduate of Centrale Paris, Delphine Ernotte Cunci started her career at France Telecom as financial analyst, before working as an econometric engineer at FT R&D. She has also served as the director of FT’s Paris shops, and was Managing Director of SDR subsidiary between 2000 and 2004. From 2004 to 2006, Delphine Ernotte Cunci was Régional Centre Val de Loire Director. In 2006, she took over the management of the Commercial Communication and the Sponsoring for Orange France. In 2008, she became the Sales and Services Director and then Head of the Consumer Market for Orange France. In 2011, she assumed responsibility for the entire operational management of Orange France as Senior Executive Vice-President Orange France and was also named Deputy Chief Executive Officer of France Telecom Group. 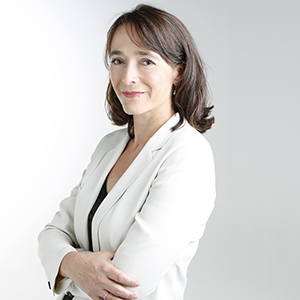 Since April 23rd 2015, she is the Chief Executive Officer of France Televisions. Today, she is member of the board of Suez environment Group, of Centrale Paris, and of « Centquatre » and President of the board of “Ecole Nationale Supérieure de la Photographie d’Arles”.